Tossed greens, mushrooms, black olives, tomatoes, green & red peppers. Fresh romaine, croutons & parmesan cheese sprinkled with black pepper. 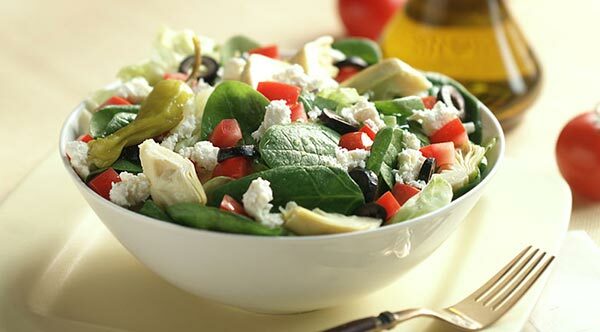 Fresh greens, marinated artichoke hearts, black olives, tomatoes, feta cheese, greek peppers & a dash of oregano. Bite-sized cinnamon rolls baked fresh and topped with real cream cheese icing. A family favorite! Willy’s Wings are baked, not fried. Crispy on the outside, tender on the inside & covered in our zesty buffalo wing sauce! Get ready for garlicky goodness! Delicious bread sticks, smothered in garlic & cheese. Stuffed with the freshest ingredients & folded over with our pizza dough. Choose from any Signature recipe, or create your own. Additional toppings are $1 each. Marinated artichoke hearts, black olives, mushrooms, green & red peppers, red onions & roma tomatoes; topped with cheddar & provolone cheese. Italian sausage, salami, Canadian bacon, pepperoni, seasoned beef, mushrooms, black olives, green & red peppers, red onions & sliced tomatoes with cheddar & provolone cheese on top. Mozzarella & fontina cheese on a zesty garlic sauce base with fresh spinach, sliced roma tomatoes, mushrooms, spicy sausage & fresh basil topped with cheddar & provolone cheese. Olive oil glaze, mozzarella, fresh garlic, spinach & sun-dried tomatoes, topped with feta & oregano. Mozzarella, fontina, cheddar, provolone & parmesan cheeses on your choice of an olive oil glaze or fresh tomato sauce base. Olive oil glaze, mozzarella cheese, fresh garlic, marinated artichoke hearts, fresh spinach, diced tomatoes; topped with feta cheese & oregano. Marinated artichoke hearts, roma tomatoes, mushrooms, green & red peppers; topped with cheddar & provolone cheese. Fresh garlic, basil & roma tomatoes on your choice of an olive oil glaze or fresh tomato sauce base, topped with cheddar & provolone cheese. Marinated artichoke hearts, peppitas & diced roma tomatoes on a basil-pesto base, topped with feta cheese & oregano. Olive oil glaze, barbecue sauce, mozzarella, smoked chicken, red onions & cilantro; topped with cheddar & provolone cheese. Canadian bacon, smoked applewood bacon, smoked chicken & diced roma tomatoes on a zesty garlic sauce base, topped with cheddar & provolone cheese. Smoked chicken, smoked bacon, diced roma tomatoes, red onions, fresh garlic & oregano atop an olive oil glaze; topped with cheddar & provolone cheese. Canadian bacon, pineapple & mandarin oranges topped with cheddar & provolone. Pepperoni, Italian sausage, mushrooms & black olives topped with cheddar & provolone cheese. Seasoned beef, diced roma tomatoes, red onion, black olives & fresh garlic topped with feta & oregano. Green & red peppers, diced roma tomatoes & smoked bacon on a zesty garlic sauce base, topped with cheddar & provolone cheese. Fresh jalapeños, hot-n-spicy sausage, red onion, black olives, roma tomatoes, crushed red peppers & cilantro on an olive oil glaze, topped with cheddar & provolone cheese. Canadian bacon, pepperoni, seasoned beef, salami & sausage topped with cheddar & provolone cheese.